Now, one of these ducks is clearly a male Blue-winged Teal, but its buddy looks a bit off, wouldn’t you say? Are you willing to hazard a guess about its lineage? This odd duck appears to be Blue-winged x Cinnamon Teal. Certain aspects of this identification are problematic, such as the bird’s shape, location, and limited cinnamon rustiness on its body or breast. However, Blue-winged x Cinnamon crosses have been spotted before by, for example, Bill Schmoker, Greg Lasley, and still others. Clearly at least two teal species take to each other. What about the rest? 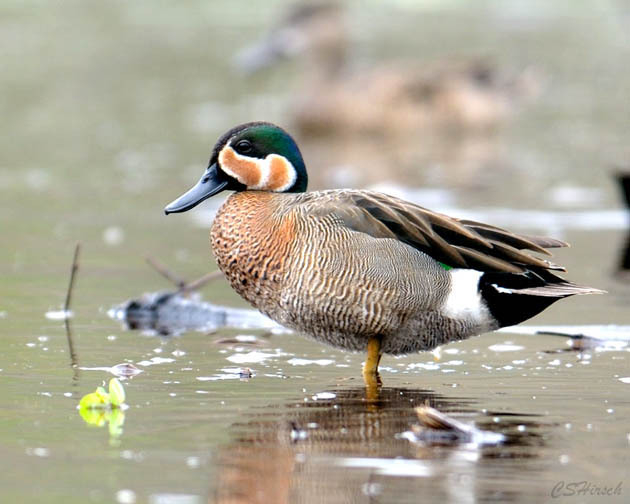 Researching this single hybrid revealed that teals are as liberal with their love as mallards! Realizing how extensive the dalliances of these ducks really were, I turned to an expert. Jörn Lehmhus has studied hybrid ducks more extensively than anyone I know; his Flickr set on hybrids may be the most extensive resource on the topic online anywhere! 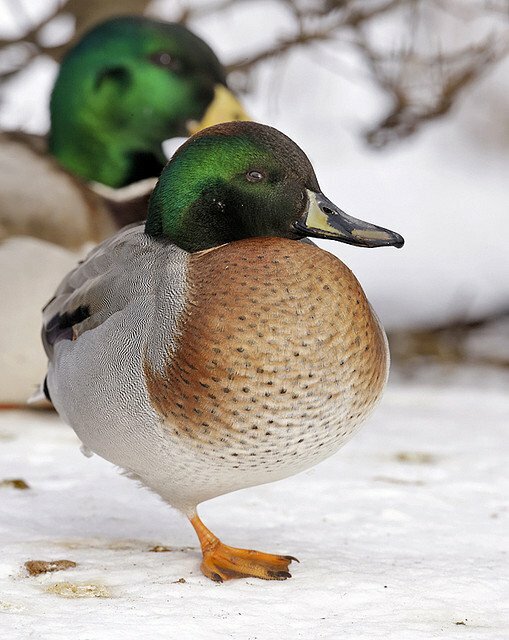 Hybrid ducks can be a pain to identify, as they are not just intermediate between parent species, but can show patterns resembling a third species or even some patterns and colorations existing in no true duck species anywhere in the world. 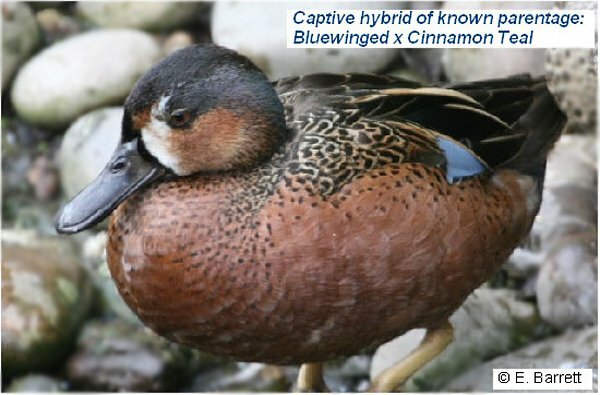 Therefore when Mike addressed me with a request concerning hybrid teals, I thought it a good idea to address some misidentifications in the web. 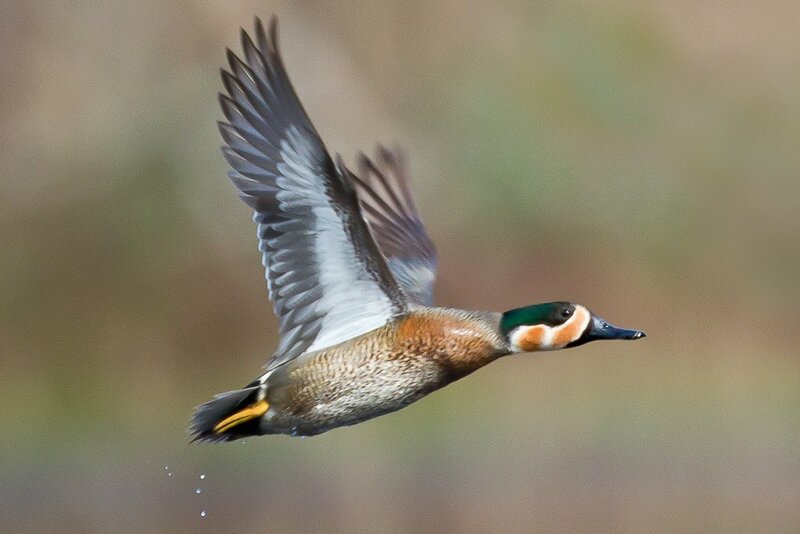 Blue-winged x Cinnamon Teal makes for a very variable hybrid. This captive individual photographed by Liz Barrett has a greyish head patch starting around the eye, which may in shape slightly resemble the green head patch of Green-winged Teal. 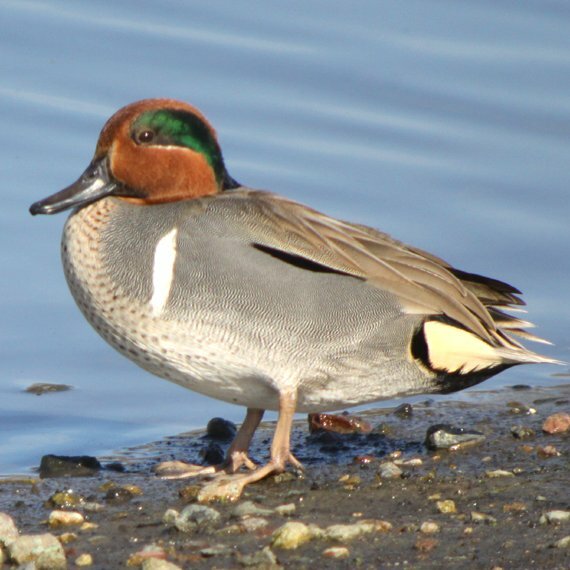 This duck’s head pattern is typical with a slight resemblance to Baikal Teal or hybrid Green-winged x Cinnamon Teal due to the green iridescence in the dark patch over the eye. The flanks are partly striped but also finely vermiculated in part. HOW ABOUT THOSE GREEN-WINGED TEALS? David Sibley offers an excellent tutorial on separating these two teals, including original renderings of variant intergrade or hybrid Eurasian x American Green-winged Teals. In fact, this pattern and coloration strongly resembles that of the southern hemisphere species Australasian Shoveler (including New Zealand Shoveler), but the hybrid also shows important differences like the distinct green iridescence of the head, lighter flanks, and finer patterning on breast and flanks. 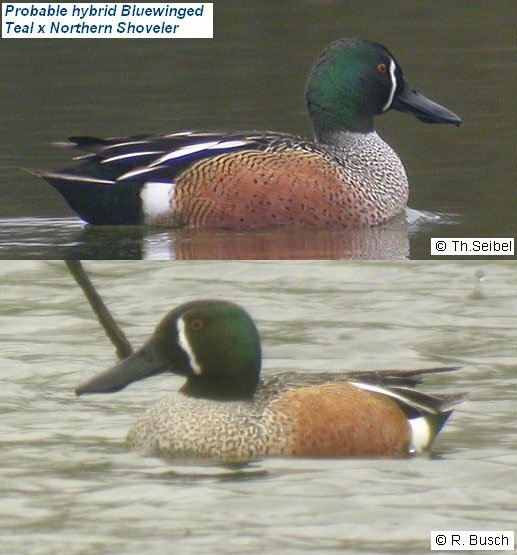 The Blue-winged Teal x Northern Shoveler is also rather similar to the Cinnamon Teal x Northern Shoveler, which can easily lead to misidentification. The head pattern of the Cinnamon Teal x Northern Shoveler hybrid is very similar to the previous hybrid. Also there may occur some dark spotting on the rust red breast and in some cases rather faint barring on the rear flanks. So how do we know this bird isn’t just another variant Blue-winged Teal x Northern Shoveler hybrid? On the one hand, a description exists of a captive hybrid of known parentage (male Cinnamon Teal x female Northern Shoveler), which had a similar head pattern and body coloration. 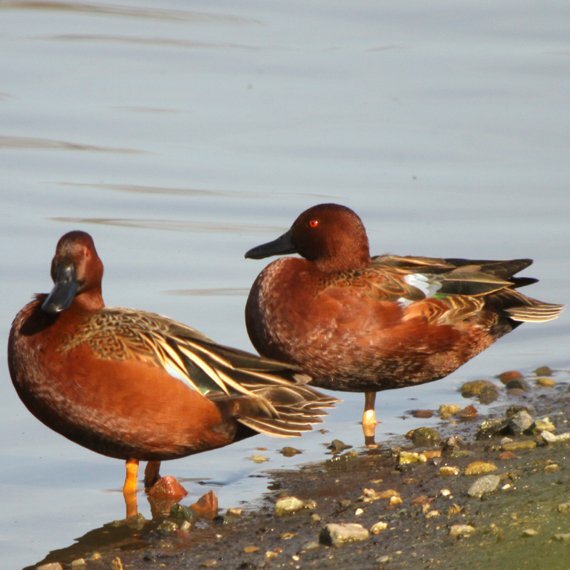 In contrast to Blue-winged Teal x Northern Shoveler hybrids, the iris colour in Cinnamon Teal x Northern Shoveler is either clear yellow, orange, or red. The breast and flanks are a darker rusty red, darker and the pale patch on the rear flanks can be white but often has a slight rusty colour tinge. 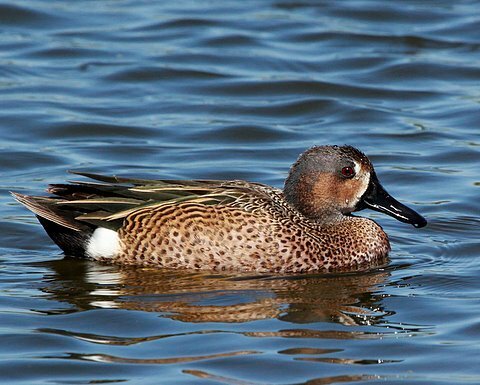 You can find small dabbling ducks called teals all over the world. 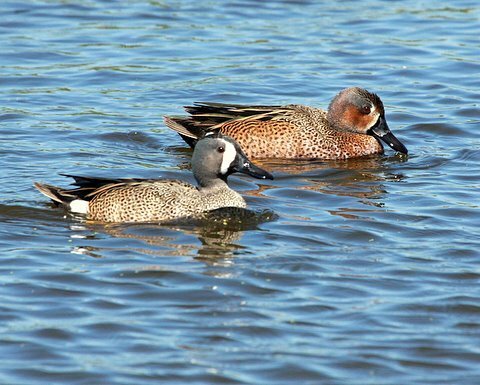 These teals can also hybridize, but for the sake of both brevity and sanity we’ll stop with the aforementioned North American hybrids. 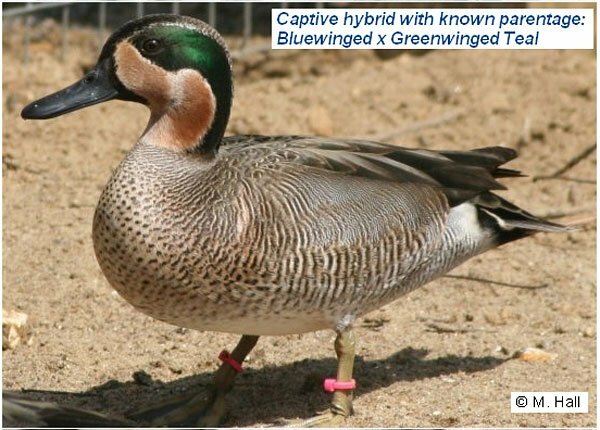 A general rule when looking at a hybrid teal is that the variability of hybrids often is much broader than that of either parent species. Even so, hybrids not identifiable after comparison with the images presented here might involve one (or two) of these other teals. Aren’t hybrid ducks fun? 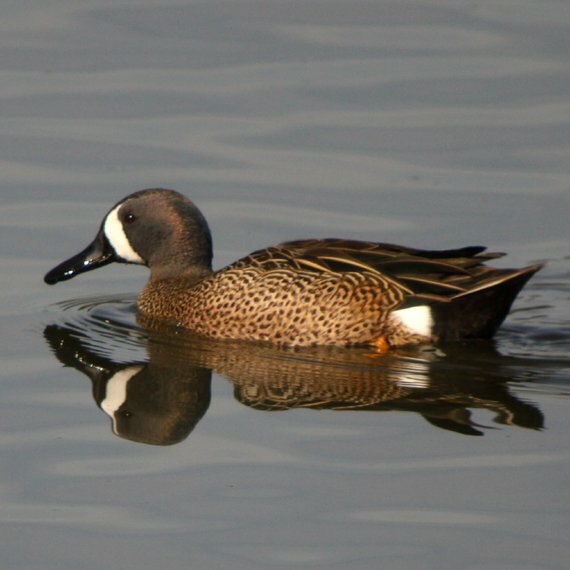 If you have great photos of hybrid teals you’d like us to add to this gallery, send them to mike AT 10000birds DOT com! Bitchin’ post, Mike! As a blogger I can appreciate what went into it. Those hybrid teal are sharp-looking birds–I think my favorite is the shoveler x blue-winged teal. Neat, neat bird. Thank you for laying this out so clearly and beautifully. A labor of love, much appreciated. @Alan, I’d love to see those photos. @Julie, thanks! This was definitely a lot of fun to put together, but I admit to becoming a bit intimidated once I realized the scope of the project. Luckily, Jörn Lehmhus generously shared his expertise in this sordid and specialized area, as did many others! Over on Project Noah, we are debating about a duck that may be some kind of Mallard x ? Teal Hybrid. Hope you can see this..
the Cinnamon Teal x Shoveler hybrid from above is confirmed as I had the chance to see a photo of the captive bred hybrid shoveler x cinnamon teal from the Natural History Museum at Tring , England. That bird with known parentage matches the wild ones exactly. Jörn, you continue to amaze me. I knew the bird wasn’t a mallard x teal, but thought it looked superficially like a teal x teal cross. Glad you came to the rescue! I spotted this odd teal in Galveston on Nov 6th, 2011. It appears to be a Blue-winged x Green-winged cross. Wow, David, I can’t figure out what that bird is. Mind if I post the photo for more potential input? David, I’d say there is Gadwall parentage in that bird. Maybe GW x Gadwall? are actually no hybrids in my opinion, but just Greenwinged Teal in plumage change in between eclipse plumage and breeding plumage. Ducks can look very odd during this time. Just found about your blog on hybrids, especially Teal and I photographed this duck this morning in Arizona. It was in a huge flock of Cinnamon Teal and also quite a few Green-wing Teal. Also had a few Shovelers not far away. Any idea if this might be a hybrid, or maybe nothing at all. My first thought in the field was Cin X BW, but this one does not look like the other examples, so maybe something else. I also photographed a possible luecistic Cinnamon Teal in the same flock. I am having a heck of a time id’ing a group of ducks at my neighborhood pond. The pictures on this site are the closest I can get to them. I have never seen anything like them before. They look a lot like Shovelers with the unmistakeable bills, have greyish heads, set low in the water,have blue bands on their wings, but the frustrating thing is that they DIVE!!! There are Shovelers, Widgeons, and Green Wing Teals present and they all showed up at about the same time. But none of these are divers. They are all dabblers. Any clues? I have not been successful at getting good pictures, but will keep trying. It does not look like others that I can find of this combination, though, and takes more after the GWTE side.